What Are Managed Communication Services and Why Should You Implement Them? Managed communication services can be an advantageous option for firms looking to save money. Communication systems can be optimized by managed service providers and bring in tremendous value at a comparatively low cost. The value from these services, which encompass phone systems featuring VoIP, makes it a sound investment for firms of all sizes. Managed communication services, or MCS, furnish essential communication technology services through a managed service provider. Many savvy businesses use managed communication services to outsource the technical end of their communications operations; phone systems. This is an important trend to follow as the practice of outsourcing communications management becomes more common. Why managed services? A managed service provider can save firms two of their favorite things, time and money. While these savings are great in their own right, managed communication services have much more to offer. 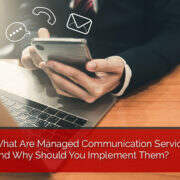 Here is what firms need to know about managed communication services and why they should incorporate them into their business. Management should take a hard look at their budgets and isolate the most expensive and challenging operations. Outsourcing IT and communication operations to a managed communication service provider is one of the savviest decisions a business can make. Firms that perform their own communication services in-house incur larger expenses. Paying for the salaries and benefits of full-time staff takes away from the bottom line. The installation, maintenance, and support that office communication equipment requires can be expensive to handle independently. This money can be put to better use elsewhere when a managed service provider is handling their communication technology. Out of all the benefits of having a managed service provider to handle a firm’s communication technology, mobility is the most advantageous. A managed service provider will setup a robust communication system that will keep information flowing far beyond the office. Offices can be outfitted with a phone system that can reach remote offices, and with Smile’s offerings, incoming calls to the offices can be routed to multiple phones, including office, home, and mobile phones. This makes sure that important phone calls won’t be missed when away from the office. Communication is key in today’s market and missing a phone call can break a deal or lose a sale. Don’t let that happen. Firms with robust communication systems installed and maintained through a managed service provider like Smile enjoy greater productivity and lower costs. A skilled managed service provider turns the office into a Wi-Fi hotspot. This can be a tremendous advantage and help streamline office-wide communication via wireless handsets. These handsets provide a secure and trusted form of communication that allows employees to communicate irrespective of their location in the building. This is made possible by Smile’s facilitation of wireless access points. VoIP is another key advantage of having a managed communication service provider. This technology allows users to make calls over the internet. This great feature can be installed using an office’s pre-existing cabling infrastructure and eliminates the headaches of traditional telephone wiring, including the cost! With VoIP, employees can communicate with USB headsets or the handsets discussed previously. Firms that procure their MCS from a reputable company like Smile also receive extensive consulting support. Smile sustains system quality and keeps all communication components running smoothly and well maintained. Their clients enjoy the comfort of having a team standing by to handle any technical problems that may come up. When a firm has a reliable managed communication service provider, they get a full communications system. A communication system is far superior to having disjointed phones and communication components that are not strategically integrated into the office environment. This is much more than a phone system. Communication systems combine the use of digital phones and VoIP phones, and wireless handsets. With Smile, these systems come as customizable packages, giving businesses the freedom to develop the perfect communication system for their needs. The right managed service provider to handle a firm’s communications can make all the difference in terms of the value of the service. Smile’s services for instance, are some of the most valuable on the market. Not all managed service providers are equal in quality, and many have limited their managed communication services because of the rigor and organization required to provide them. Smile has mastered the art and can bring businesses the finest in communication technology at an enticing price point. Save time and money when you call Smile Business Products. They have communication solutions for the modern business environment that help firms stay competitive and efficient through superior communications management. 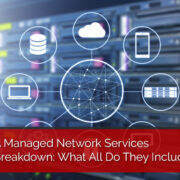 A Managed Network Services Breakdown: What All Do They Include? Network management services are a great way to save time and money as a business. Firms that take advantage of network management services stay competitive and free up more time for employees to perform more important work. These services can sound confusing, but they are anything but. In fact, they make business operations smoother, easier, and help keep the workplace more productive overall. Let’s give it to you straight, offices need network management services to stay competitive. So what are these great services? Network management services are essentially IT network services that are outsourced to firms that can manage these tasks with greater efficiency and at a lower cost than most in house operations allow. While outsourcing network operations, maintenance, and security, firms not only save money, they free up time to put vital staff members to better use. A workforce in a firm with a managed network service provider, is a leaner, more concise and financially competitive workforce. In business today, the question isn’t why use managed services, but why not to use them. Communication technology is changing and having a managed service provider is a competitive edge. The advantage is found in enormous cost savings, greater operational efficiency, and more time for key staff such as IT personnel to do more important tasks. What Is Included with Network Management Services? In weighing the cost and determining whether the incorporation of network management services are necessary, the ROI makes these services highly recommendable. Featured services include security, system maintenance, instant helpdesk support, equipment management, and more. One of the most essential features provided in a managed network are the powerful and reliable security services. Endpoint security is best left to a managed service and will save businesses the cost of hosting full-time cybersecurity staff. By shifting information security and data backups to a managed network service provider, firms save bundles of money while enjoying the protections of a secured network. Endpoint security includes vital protections such as a robust firewall, strong Anti-Virus, Anti-Spyware software, blacklist monitoring, and more. In today’s business environment, rife with cyber-attacks, data breaches, and ransomware threats, having a third-party management service to cover all the bases is essential. In addition to data backups, network management services provide first class disaster recovery features that can save businesses when all else fails. Disaster recovery options are essential for businesses today. Ransomware attacks and other malware are capable of leveling a firm’s data overnight. Don’t get caught without proper protections and methods of recourse. Another reason why network management services are so advisable to retain and so important to communication technology, is the savings on cost and maintenance. Network maintenance is a vital function in sustaining a smooth and well performing system. Retaining a team of full-time IT staff to perform network system maintenance is expensive. This practice is a great deal more expensive in the long run than simply outsourcing network services to a network management services provider. Additionally, maintenance performed by network management services are proactive and quell problems before they start with automated monitoring and equipment management. Furthermore, network management services allow firm executives to control IT operating costs. This is a powerful advantage that many managers will readily relish. With the ability to rein in and structure the costs generated by the IT department, concerning networks specifically, gives businesses an enviable edge. The practice of relying on network management services reduces IT departmental budgets, and makes costs more predictable. Cost predictability is a highly coveted capability in a market where every dollar counts. Another unique feature provided by network management services are their mobile solutions. These are often closely related to security features as companies can track their employee’s mobile devices when carrying sensitive data. In addition to security features, under a network management services using mobile device application management, firms can initiate and manage secure enterprise apps. Finally, mobile connections to network resources are also managed and kept secure. Don’t fall behind the competition. Keep your firm’s network running smooth at a lower cost and save time on menial network tasks with a managed service provider. In today’s world it can be risky to do business with so much vital information passing through networks, however with a managed service provider, firms can continue their work worry free. The benefits in cost savings, time, and manpower make it a smart choice for firms to retain a reliable managed network service provider. Make the right call, literally. Get hold of us and see why managed services are the way to go. Smile Business Products is the managed service provider of choice in a competitive market.